We can't do without the mobile phone for 24 hours, we need the power bank to continue the power. But because of forgetfulness, I often forget to bring a plug, and I can't recharge the power bank in time. This is a very tricky thing. Recommend a small and practical power bank 5200 for you today, from the brand Heloideo. It comes with a plug, which is both a power bank 5200 and a charging plug. Plug the AC plug and plug it directly into the socket to charge the power bank.When charging, there are no messy wires and the surrounding environment is more tidy. 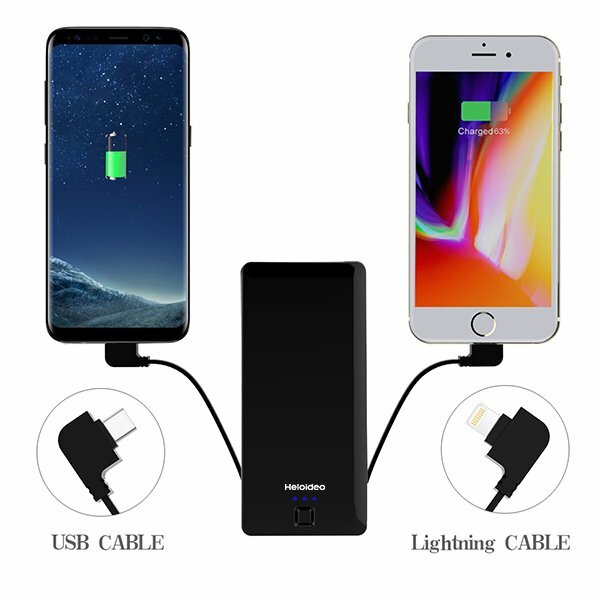 It can also be used as a charging plug, power bank will preferentially charge the electronic device, and then charge itself. Go out, travel with you, don't be cumbersome; take it with your mobile phone while charging, don't be heavy. The battery capacity is 5200 mAh, for example, iphone8, you can fill it 2 times.Going out, the phone’s power is always full, too satisfying. The power bank 5200 with a usb output, built-in two charging lines, can charge two devices at the same time. It is worth mentioning that there is a led indicator on the power bank, which will display the remaining power of power bank, which will flash when charging. When all the LED lights are on, it means that the power bank is fully charged, and the battery is fully charged. When the power bank only has one LED light flashing, it indicates that the battery is insufficient, and the power bank should be charged.